Beaducation: The Blog: Giveaway day PART TWO!!!!! Comments closed!!!! We will let you know who won in just a few! Okay. Continuing on with our launch day festivities!!!! The FB giveaway went just great! We loved reading all of your comments. Congrats to Denise F!!!! I sent you an email with instructions so that we can send your book out! Hope you enjoy it! Now, have we got a prize for you. Leave a comment below. If your entry does not have your contact info, please leave your name in the comment so we can let you know that you have WON!!! Off to have a celebratory glass of Champagne! Such a neat bracelet (pick me pick me pick me!). Thanks for the opportunity! Please email redhedjny at yahoo dot com. I love this bracelet! Please pick me!! Wow, that looks very very cool! Thanks for the opportunity to win! Would love to win this kit! I'm new to stamping but I think I'm ready to branch out. I would love to win this bracelet kit! Of course that would mean I would need to buy some new tools. would love to win the bracelet and am sorry I missed the 1st giveaway. oooh...pretty! I want to learn how to make one. I would LOVE this bracelet!!! Pick me - pick me!! 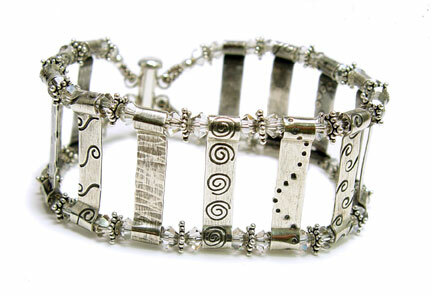 What a gorgeous bracelet, I'd love to make one! Are UK residents allowed to enter? I'd sooooo love to win this! I have been wanting to do the stamping on metal, but have not yet been able to get the parts I needed (finances, not not being able to find). This is a beautiful bracelet!!! My hand is raised...pick me. Well THAT looks like fun! I'm in! I am a beginner beader, but I have an attraction to metal working. This bracelet looks like a great starter project. (hint)(hint)Hahaha! Thanks for the opportunity to win such a fun looking kit! What a fun day of giveaways at my favorite store!!! Yeah! Can't wait to get my preordered book.....hope it comes soon! I need it! Would love to win this little extra...it's a beautiful bracelet! Congrats Lisa on your book! Sorry, didn't know if you had my info. I'd love to win this! I've been admiring that bracelet and would love to learn how to make it!, pick me, please! I want to win! Pick me, pick me. Beautiful! Would love to make one! Happy Day! I wanna win, I wanna win! I love allllll the stuff you ladies are doing and I wanna win! I would LOVE to be able to make this bracelet from the kit! Pick me, pick me, pretty please! I missed HOW last year and looks like I will this year too :( so I could use a little Beaducation love! And my name is "Lisa" too...hee hee. I would love to make this bracelet but being on a fixed income, have not had the funds for the supplies. I hope I am picked to win this. Ooh, I love this bracelet, I would be so excited to win all the goodies to make it! Of course I'm in!!! I can think of so many cool little sayings to put on your great bracelet. I already have 2 or 3 designed in my head right now!! On my way to pick up a copy of the book!!! WOO HOOO!! !